Why have separate Twitter lists? I have separate lists because I have different interests. 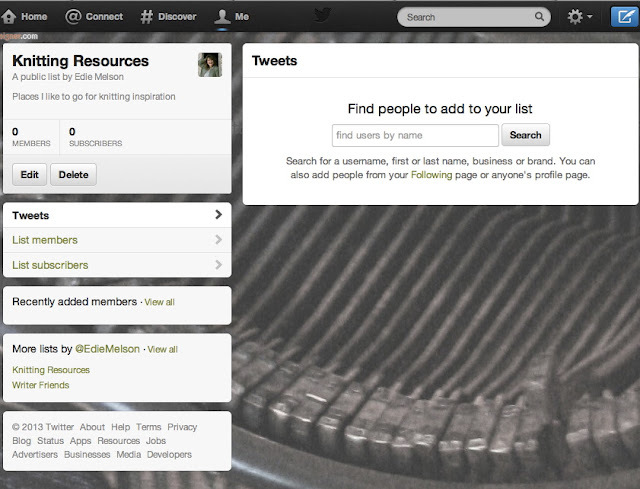 I follow lists of writers, lists of editors, lists of publishers, lists of social media enthusiasts. And that’s just with my career. I’m also interested in things to do with the military, because of my book, Fighting Fear: Winning theWar at Home When Your Soldier Leaves for Battle. I follow people who help families of deployed military, things for veterans, things to do with veterans with disabilities. I also have hobbies. I follow a list about crafting, and several about knitting, even one about jewelry. This means, I follow all these varied people and profiles on Twitter. Can you imagine what my twitter stream looks like when I try to make sense out of it without lists?!? Trust me, it’s not pretty. And this is just one reason to have varied Twitter lists. Let’s go into all them, in one place. 1. Lists that represent your varied interests. I don’t have to explain that since I went into it in the previous paragraphs. I have to say this is one of the nicest I’ve ever received. Thank you, Jane! #FF: @EdieMelson @RebaJHoffman @BethVogt @RachaelHauck @LisaJordan @Melissa_Tagg @MichellLim24 @SusanMayWarren - Great folks to follow! 3. Lists of your customers. If you sell anything, from services, to books, to a product, build a list of customers. 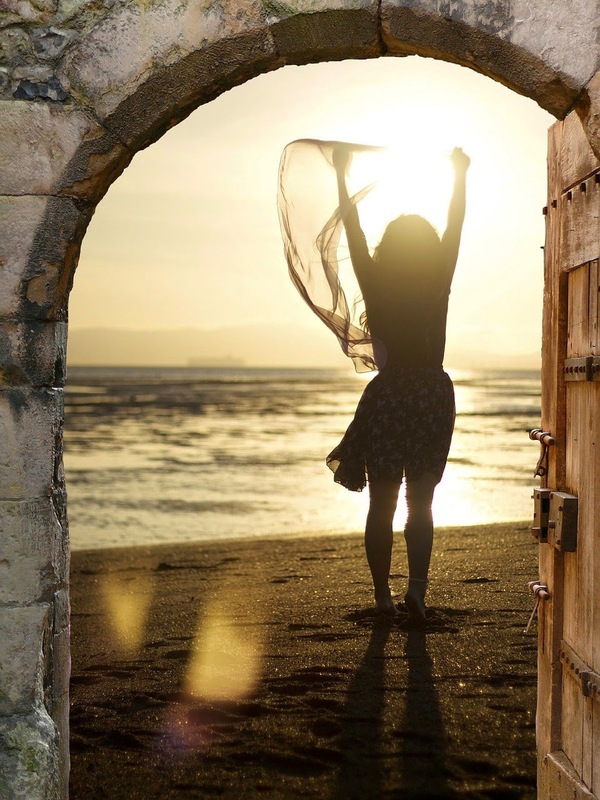 For a romance writer the list would include bloggers who review romance books, places and people who promote romance books, magazines that are geared to either romance readers or romance novelists, etc. You get the idea. 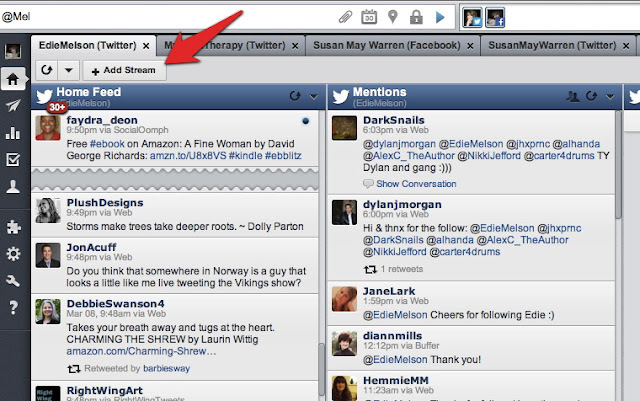 After clicking CREATE LIST, you’ll see a pop-up window (in the screenshot below). Here you can name your list and describe it. You can also set it as public or private. Most of my lists are public and that’s good because other people can follow them. Some, like my list of those who mention me are private, because truthfully, only I need that information. 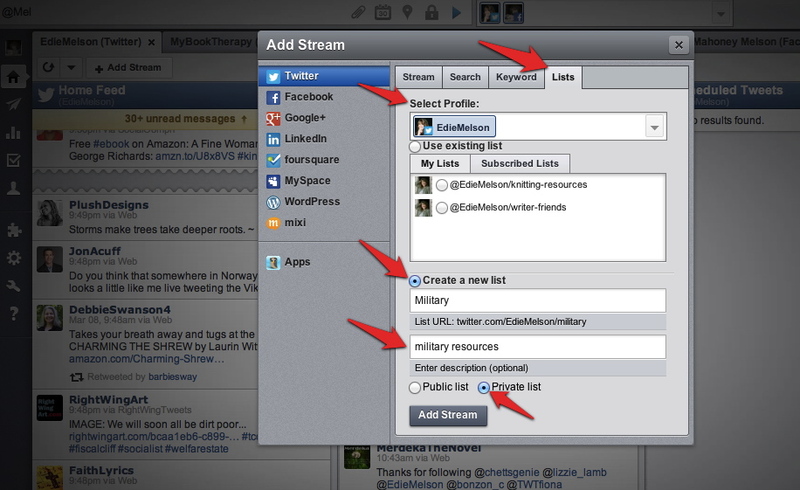 You create lists through the ADD STREAM window (see screenshot below). 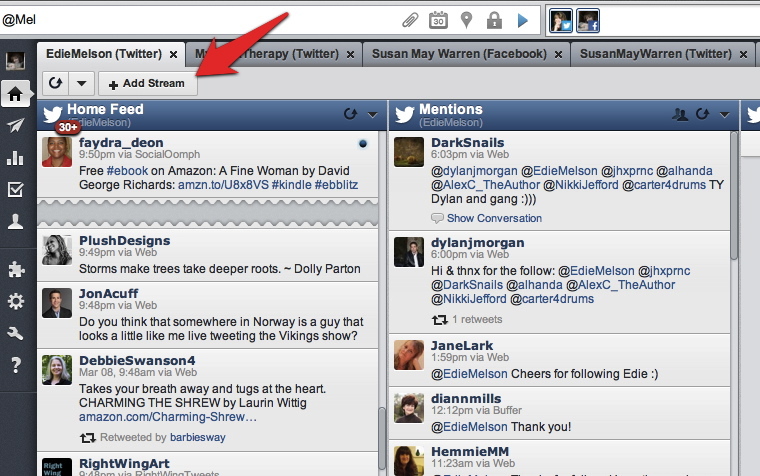 After you click ADD STREAM you'll see a pop-up window with lots of options. You want to choose LISTS from the options across the top of the window. Then choose your PROFILE. Since this is a Twitter list, choose your Twitter profile. 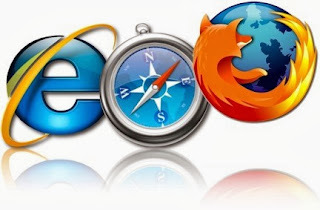 Now click CREATE NEW LIST and type the name of the list in the box provided. Now type in the description of the new list. click ADD STREAM. All of this is highlighted in the screenshot below. You don't have to always develop your own lists, you can subscribe to lists that others have developed. One of my favorite Twitter lists is curated by Alton Gansky. He has a list of publishers that I subscribe to. It's a public list, so you can subscribe too. Just visit his Twitter page, @AltonGansky FOLLOW him, then click on LISTS and click on PUBLISHERS. This will take you to his Twitter List page and here you can click on SUBSCRIBE. I've covered a lot of info today, so if you have questions about twitter lists or a suggestion of a valuable list to develop or follow, please leave a comment in the section below. I do a lot of teaching about social media online and at conferences all around the country. One of the things I’m asked about the most is how to increase my Twitter followers. I haven’t run into many people who don’t want to increase their numbers, so today I’m going to give you my top 10 ways to get more Twitter followers. Why do I want more Twitter followers? It increases my reach, and makes it easier to spread the word, no matter what my message. 1. Be sure to follow people back. It’s considered good manners to follow people back who follow you. This doesn’t mean you have to follow people who make you uncomfortable or who are trying to sell you 10,000 followers. Use common sense, but unless there’s a good reason be nice and follow people back. 2. Don’t PROTECT YOUR TWEETS. On your Twitter profile there’s the option to protect your tweets. This locks your account and doesn’t let people follow you unless you approve them. If you feel the need to protect your tweets, you really shouldn’t be on Twitter. 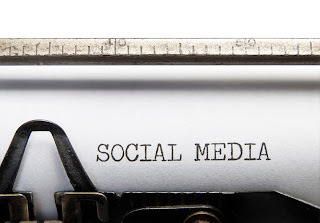 This social media platform is a place to get found, not lurk. 4. Show your face. Always use a picture of YOURSELF as your Twitter icon. The evidence is overwhelming. People respond to a head shot where you can see the person’s smile. The only exception is if you have a business account. 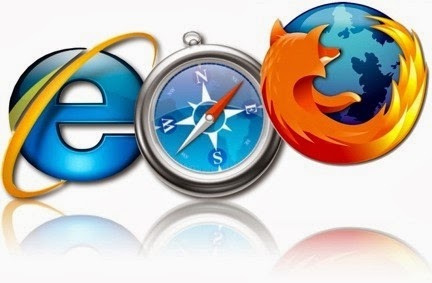 Then you can use your company’s logo. 5. Have a regular presence on Twitter. I Tweet a lot more now than I did when I started out. More first goal was to Tweet four to six times each day, four or five days a week. I use Hootsuite to schedule my Tweets throughout the day. Here's a post I wrote on How to use Hootsuite to help you get started. Do NOT send out all your tweets at once. This is called hogging the stream and is the height of bad manners! 6. BE CONSISTENT with the subject of your tweets. I tweet about social media, writing, some books, and issues important to military families. Occasionally, I’ll find something that I just want to share outside of those topics, but that’s an exception, not the norm. 7. 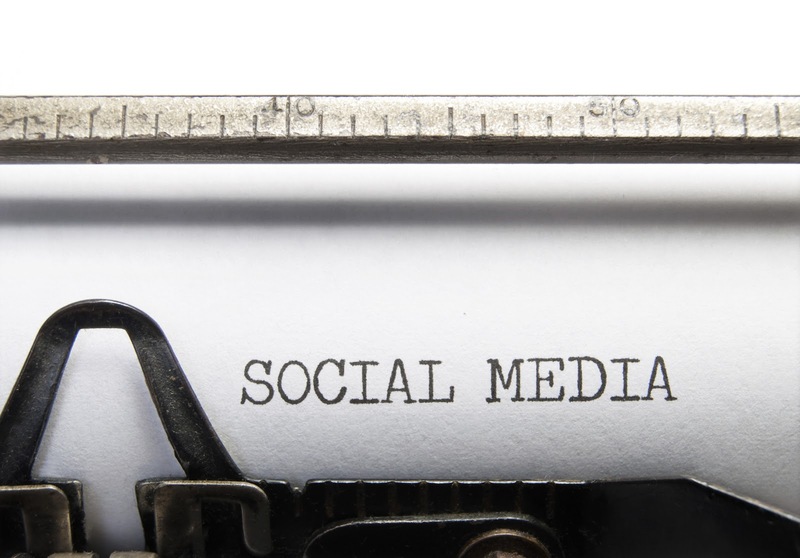 Make sure you’re sharing valuable content with your Twitter updates. Don’t make your Tweets all about you. Instead, promote others who have something valuable to say to your followers. I know it’s counter intuitive, but it works every time! 8. Look for strategic people to follow. Here’s what I mean. I’m working on a science fiction manuscript and trying to grow my Twitter followers for that specific market. To find new people to follow, I visit some of my favorite science fiction author’s profiles. Then I click on their followers. This does two things. 1. It gives me people to follow who are interested in following a scifi author. 2. It gives me a good chance of them following me back because they’re already good about following back. 9. Reply to others publically. Twitter is a public medium and people like to be mentioned. If someone says something nice about you, or mentions you, be sure to reply publically to thank them. I also keep a list of people who regularly mention me and try to find something they do that I can mention. 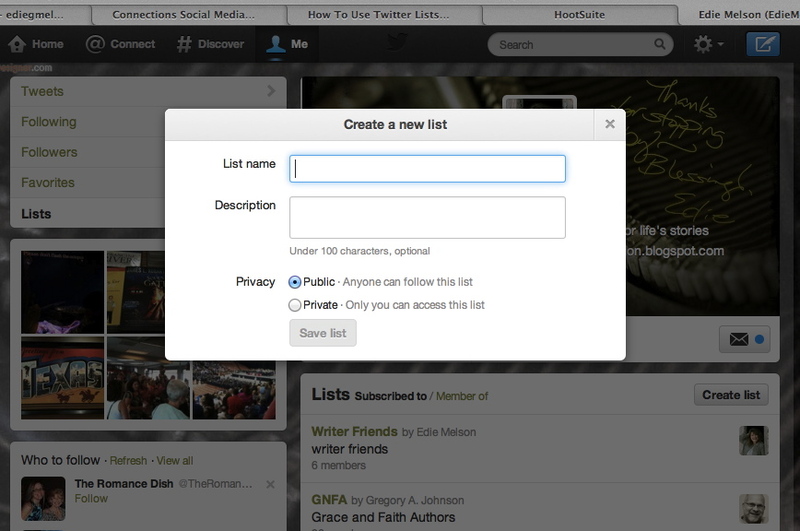 Here's a post I wrote on the Ways to Utilize Twitter Lists. 10. Don’t use an auto responder. You may think you’re being polite, but what you’re really being is irritating. Auto responders are obvious and no one likes messages from a computer clogging up their timeline. There are several things that may seem tempting for short cuts to Twitter followers. I cannot urge you strongly enough not to try them. This is one of these times when if it sounds too good to be true, it is. Do NOT buy Twitter followers. 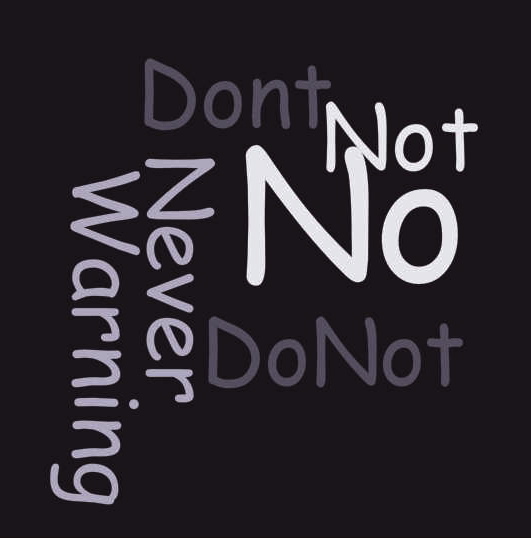 Do NOT use ANY automatic programs to increase your followers on Twitter. Twitter has very strict policies against these practices and I’ve known several people who have had their Twitter accounts suspended because of this. When you compose a social media update that includes one or two hashtags that summarize the topic, you are giving folks a way to find you. For example, I’m working on a new series of Steampunk novels. Because of that, targeting a specific type of reader—one who reads Steampunk. I find those readers within the larger group of people who read science fiction (ABA – secular) or speculative fiction (CBA – Christian). Let’s break down how I composed this update. I know that the Steampunk community loves to create costumes. So I’m giving them information they’d find useful and interesting. I used #Steampunk so that anyone searching Twitter for others who are interested in this genre can find me. 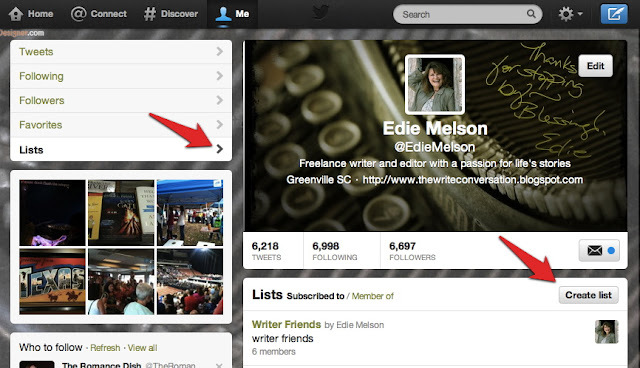 I also included @EdieMelson, because on Twitter, that is a clickable link that takes them directly to my Twitter page. Finally I used #specfic, because that’s the hashtag for speculative fiction to pull in readers who might find this interesting. If I was targeting the general market reader, instead of #specfic, I would have used #scifi. NOTE: Use # (hashtags) to denote a subject, and use @ (at sign) to denote a person or organization. With organizations, you’ll find some that hashtag their names and others use the @ sign. 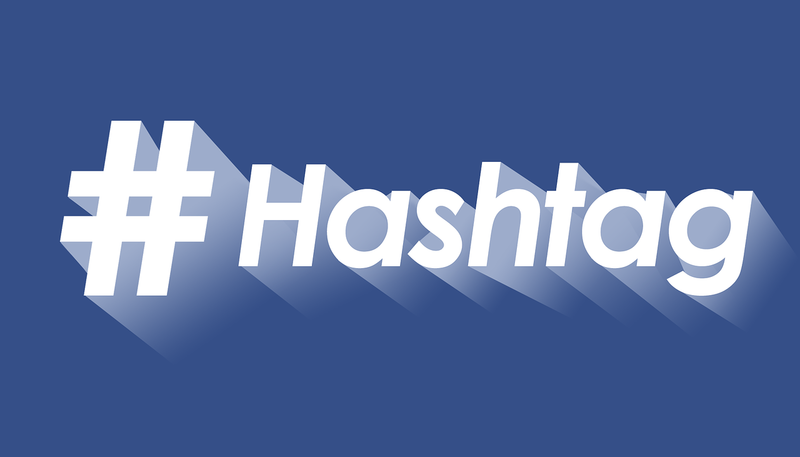 Twitter isn’t the only social media network that has hashtags. You can use hashtags in the same manner on Pinterest, Facebook, and Instagram. There may be other networks that also use them, but those are the main ones. Now, I’m going to give you an updated list of popular hashtags. 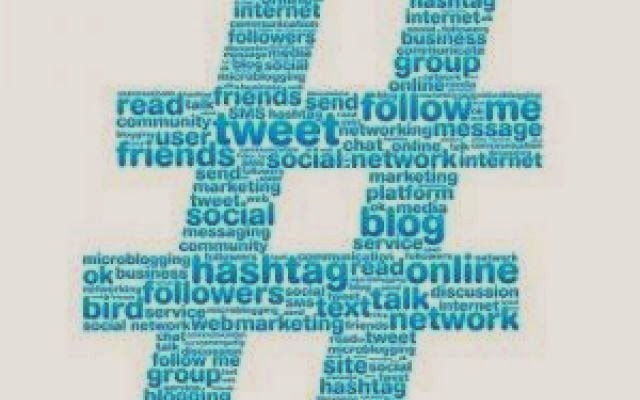 All of these should help you find the hashtags best suited to your situation. I’d love to hear from you now. 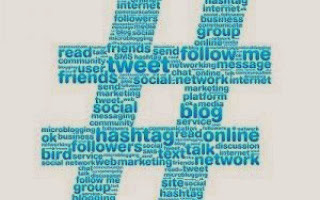 Twitter is ever-changing and hashtags come and they go. What are some of your favorites? Also, if you still have hashtag questions, post them below in the comments section. C is for Connections. The point of Twitter is to connect with other people with similar interests. It’s not your private station to broadcast commercials from. Keep self-promotion to a minimum and you’ll find some valuable relationships through this social media platform. 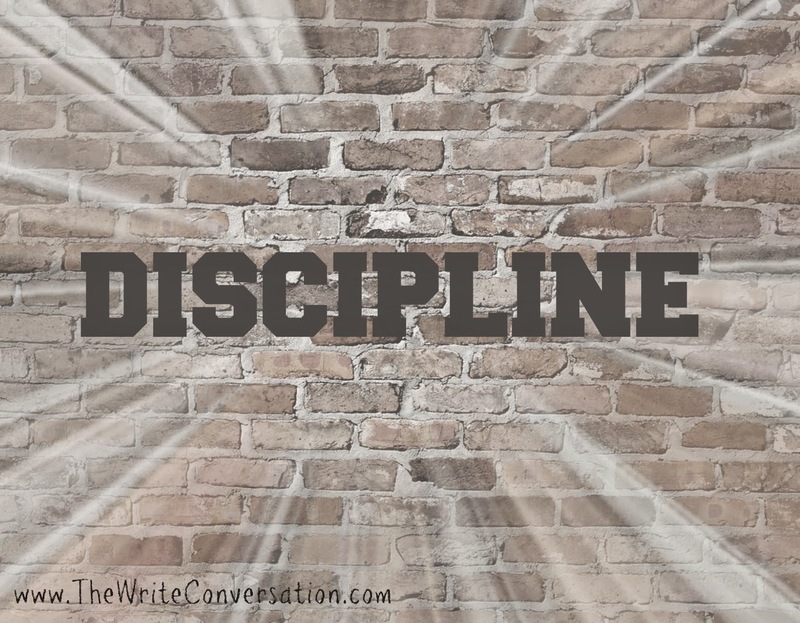 D is for Discipline. Small consistent steps will result in a strong Twitter platform. It’s not enough to share updates several days a month. Instead, set a goal for 4 – 6 updates on 3 – 4 days a week. 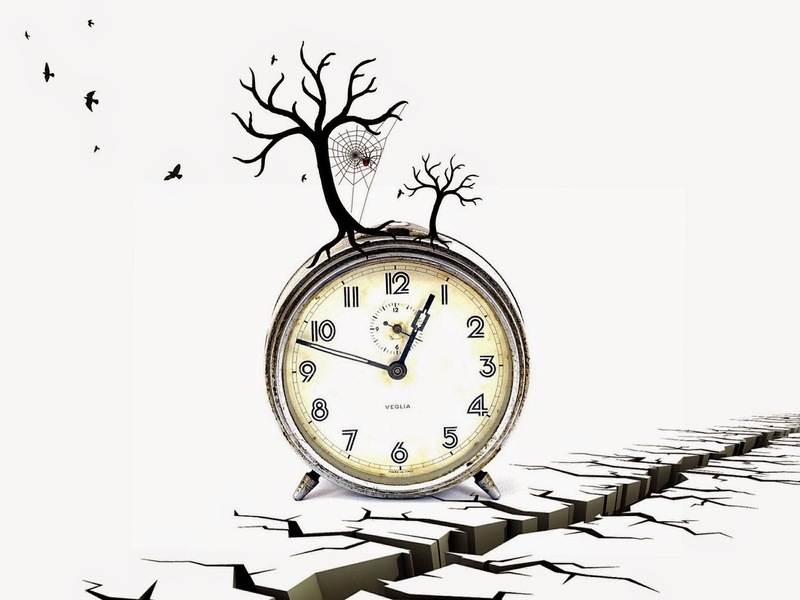 It won’t take much time, but it will pay huge dividends in visibility and reach. An inspiring quote or Bible verse. A link to something I (and hopefully my audience) finds helpful. F is for Focus. Even though I vary the types of updates I share on Twitter, I keep my message (and my Twitter personality) consistent. 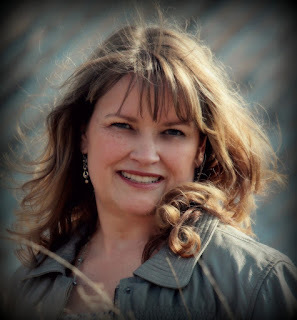 People who follow me know I post about writing, social media and things for military families. G is for Grandmother. I’m convinced that my grandmother would have enjoyed social media. It’s a digital neighborhood that she would have understood. There’s a give and take here, and a willingness to courteous and helpful. H is for Hashtags. Hashtags are one of the best things about Twitter. Do your best to limit yourself to no more than two (at the very most three) per update. And take time to do a quick search on Google for the best hashtag for the topic you’re tweeting about. I is for Irritating. Yes, there are some people on Twitter who are irritating. And if they waste my time, I don’t hesitate to unfollow them. I encourage you to do the same. J is for Jump. Don’t be afraid to jump into the Twitter universe. The easiest way to get started it to dive right in and learn as you go. K is for Keep On. Don’t expect instant results. Like anything worth doing, growing a Twitter platform takes time (and don’t forget consistency). Don’t get discouraged and give up. L is for Less is More. Even though Twitter updates can be up to 140 characters long, stop at least 20 characters early. This leaves room for retweets and comments. M is for Myself. It’s critical that we're honest and genuine on social media. We don’t have to over-share but we do need to be authentic. N is for Nice. Nice a word that is—in my opinion—underrated. I have never in my life regretted being nice, even when the other person didn’t treat me the same way. O is for having an Open Door Policy. Make yourself accessible and visible on Twitter. Don’t protect your tweets, require followers to be approved and refuse to engage in conversations. P is for Promotion. 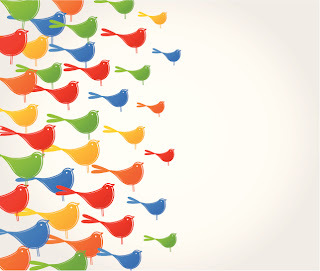 Promote others ahead of yourself and you’ll find your Twitter popularity exploding. Promote yourself ahead of others and you’ll always struggle to grow your platform. Q is for Questions. 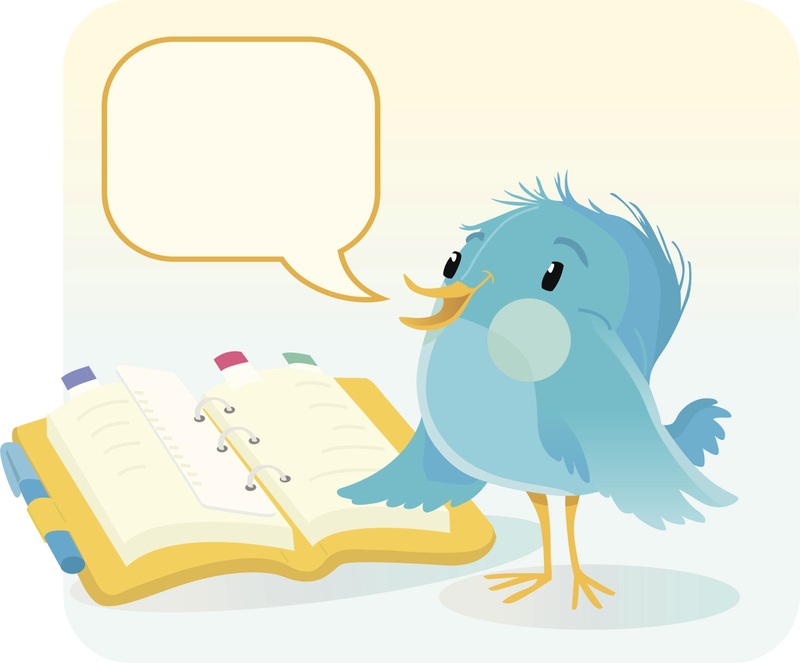 Asking questions in your Tweets is a great way to get the conversation started. Don’t neglect these types of Twitter updates when you’re planning your social media interactions. R is for Reciprocate. Twitter etiquette leans heavily on reciprocal relationships. If someone follows me, it’s proper etiquette for me to follow them back. The only reason I don’t is if the appear to be spammers or share updates that I consider inappropriate. Just because they seem to share updates that are far from my topic isn’t reason enough to not follow them back. I’ve found a lot of good connections because I took a chance and followed someone back who appeared—at first—to not share similar interests. S is for Schedule. Make sure you schedule your daily Tweets. Don’t send them all out at once, but spread them out throughout the day so you reach more of your audience. T is for Time. Watch the clock when you’re on social media. There’s a law of diminishing returns that comes into play after about thirty minutes on any social media network—Twitter included. Spend no more than thirty minutes a day and you’ll get the most return on your time investment. U is for Update. Learn which type of Twitter update to send for each situation. 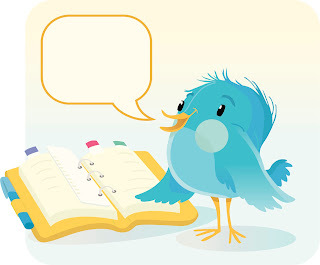 A Tweet is for something you want to share on Twitter. A Retweet is when you repeat what someone else said. It’s not the best etiquette to Retweet a post that mentions you. It’s better to Favorite the Tweet or Reply and say thank you. A Reply is when you answer or comment on a Tweet. It’s proper etiquette to Reply and say thank you when someone mentions you on Twitter. A Direct Message is private message sent to someone through Twitter. V is for Vacation. Don’t try to work Twitter (or any social media) seven days a week. Instead, give yourself regular breaks. Your tweets will stay fresh and you aren’t as likely to suffer from burnout and overload. W is for Wisdom. Be wise online. Don’t share your vacation plans in advance or while you’re gone. Don’t make yourself a target by sharing your location when you’re out. And most of all, make certain any photos you share don’t have embedded geocodes, especially if they’re pictures of children. There are people out there who are looking for such carelessness and by not being wise you are raising the risk of becoming a victim. 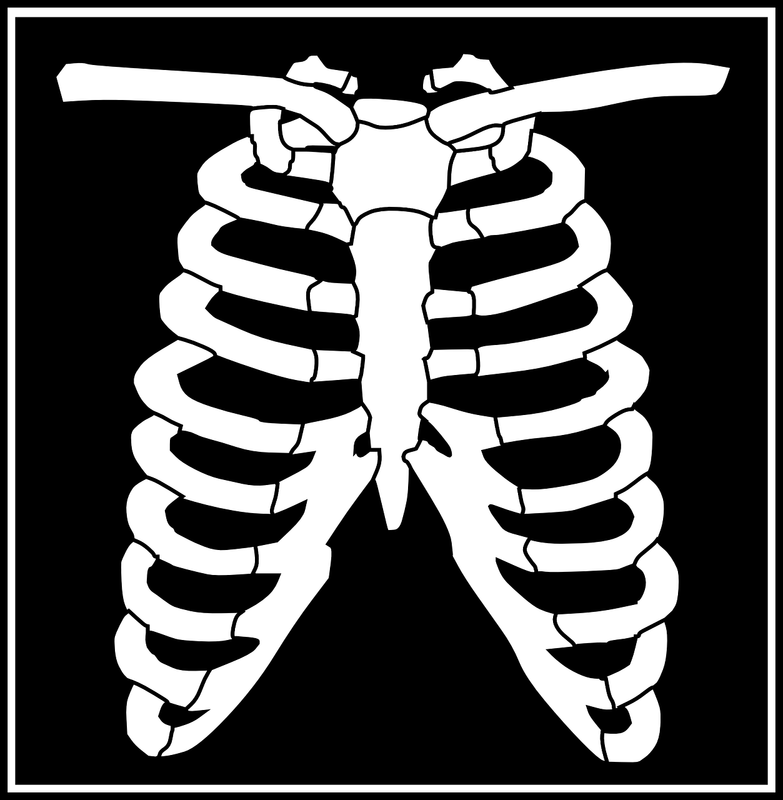 X is for X-ray. Learn the bones of a good Twitter update and you’ll never lack for something to say. I use headline writing techniques to compose my tweets and it’s the perfect way to connect with your audience in short bursts of information. Y is for Yelling. Writing a Twitter update in all caps is LIKE YELLING. I reserve my use of all caps for the title of a book (since it isn’t possible to italicize in an update). Z is for Zoo. Yes, at first glance Twitter can seem like a zoo. It can be mistaken for a series of unrelated updates that make no sense to anyone. But take time to get to know your way around and you’ll find a gold mine of relationships and connections waiting for you. 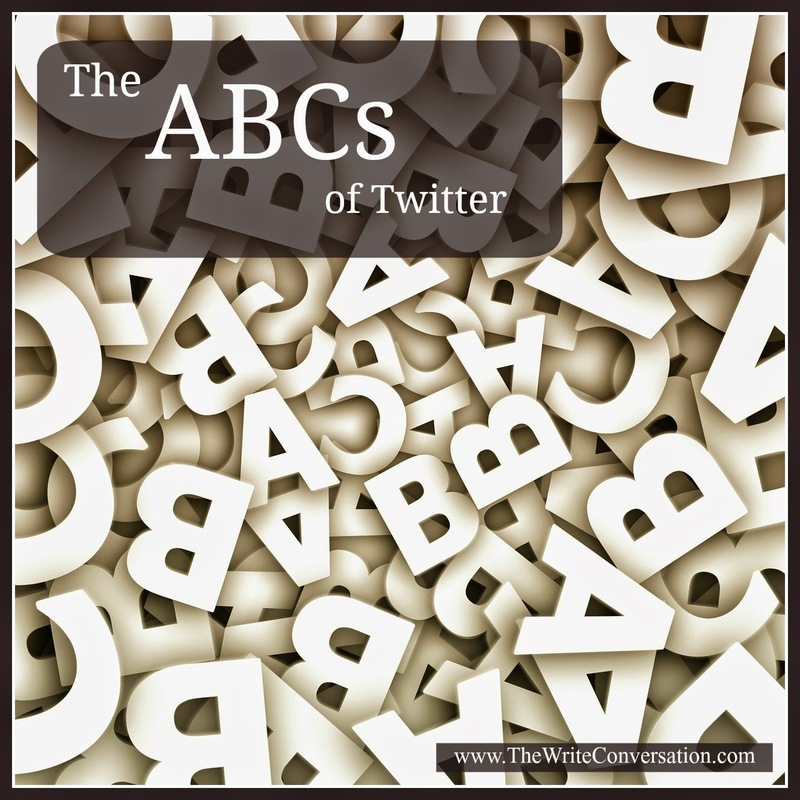 This is my Twitter alphabet, I'd love to know what you'd add to it. Be sure to leave your thoughts in the comments section below.